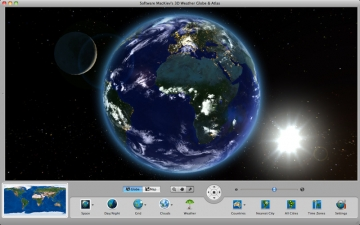 3D Weather Globe & Atlas | Mac App Storeのアプリ検索・ランキング BuzzMac! Software MacKiev's 3D Weather Globe™ & Atlas provides a complete weather package from dew point to wind chill factor, overlaid on the highest resolution NASA maps ever created for the entire Earth. Cloud cover is provided throughout the day from satellite feeds, detailed enough to see the eye of a hurricane. Route-mapping functionality is included so you can plot your own trip around the world or view one of the program's historical routes such as Amelia Earhart's attempt to circle the globe, or the voyage of Columbus to discover America. Winner of an Apple Design Award for User Experience, 3D Weather Globe & Atlas provides amazingly accurate views of Earth that also earned the product a 5-mouse review from Macworld magazine. 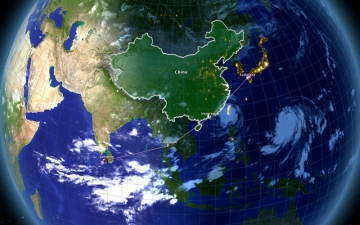 Other features include real-time day/night line, country borders, city locations, time zones and more.